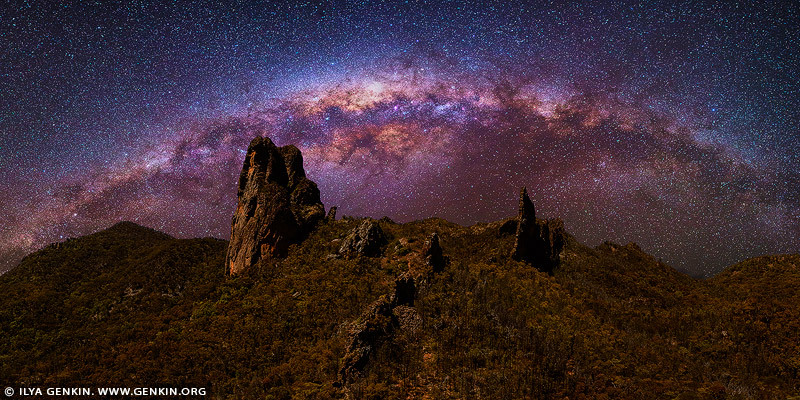 Warrumbungle National Park, near Coonabarabran in central western NSW, is Australia's only Dark Sky Park and the first in the southern hemisphere. The park is renowned for its stargazing opportunities thanks to its crystal-clear night skies, low humidity, high altitude and world-class astronomy research facility at nearby Siding Spring Observatory. Australia's largest optical telescope is within the park boundary and shares the title of the Astronomy capital of Australia with several privately owned public observatories. This and the National Heritage listing makes the Warrumbungle National Park the perfect destination for stargazers, bushwalkers, nature lovers and those looking for a unique experience. This image belongs to the travel and nature stock photo library. This stock photo of Milky Way over Warrumbungles is available for licensing for commercial and editorial uses including websites, blogs, books, magazines, brochures and advertising. Restrictions may apply for images which contain third party copyrighted material or sensitive subjects. Photos of artwork are for editorial use only. This image id AU-WARRUMBUNGLES-0007 of Milky Way over Warrumbungles, is copyrighted © by Ilya Genkin. This is not a public domain image.